Today it was time for Thyra and Buddha to enter the ring for the first time! 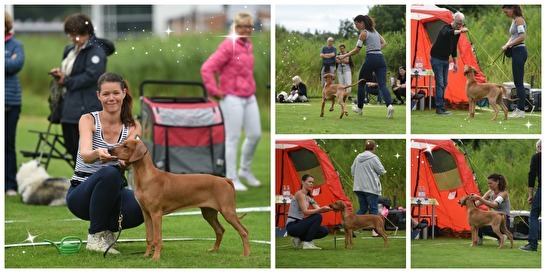 We attended a puppyshow in Kungsbacka. Firts out was Bellnodie A Pride Of My Heart Ace "Buddha" and he acted like a pro! He stood like a statue :-) I'm so happy about this prince, he just go along with things and are just happy. Love it! It was now time for him to meet his sister Bellnodie A Pride Of My Heart Joy "Thyra"! She was more in the air then on the ground! Happy and crazy, as it should be :-) She also stood like a statue, sweet little princess! Today Thyra won and went all the way to BIS-4! Happy and proud!